An illustrated guide to bread, quite technical. Worth quite alot of dough! Not especially uncommon but featured in Martin Parr's seminal collector's book ('The Photobook. A History. 1.') and so copies seem to have gone to ground. 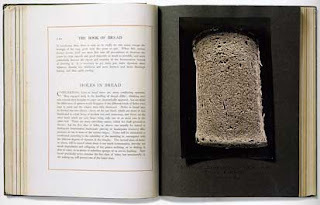 12 chromolithographic large colour plates and 27 b/w photos of loaves, with titles such a 'Holes in Bread.' Rather beautiful photos (photographer unknown.) A sort of surreal objet trouvé or, as Parr says, reminiscent of 1980s conceptual art in its obsessive style and rigorous and precise cataloguing. Parr has a 'whim of iron' as Powell said of Betjeman. Firstly let me say that I am not a Book Collector, my field is Autographs. But I might be able to throw some light on this, as I have both books, the Book of Bread, and The Book of Cakes, (not the 1991 reprinted one) I have owned these books for over 35 years, they just sat on my shelf, I regulary get the Antiques Trade Gazette, looking for anything of interest, imagine my surprise when I saw this article on this book being sold, I tracked it down to it's new owner, and it transpire's that it was owned by Elizabeth David, hence the price that was paid, then blow me, one is sold at Swanns Gallery in New York, apparently it is classed as Photographic Literture, so as a book of early photos it holds up.